Excellent quality item for reasonable price. Thank you! I bought this as a Christmas gift for my fifteen year old son, and wasn't disappointed. I did lots of research, trying to decide on a good scope for him to start out with that I could afford. He has shown an interest in astronomy, and I didn't want to start out with an underwhelming experience that might quench the flame of interest. This telescope delivered. First, of all the size, weight, and look of it is impressive. He knew he was getting a telescope, but he was still shocked and awed to see this baby. Then, we assembled it. I was afraid it would be too complicated and he would lose interest, but it went together easily, and he was able to do much of it. Soon, we had it fully assembled, and we're ready to take it outside to align the viewfinder. It was late morning, and we pointed the scope at some terrestrial objects. We were both impressed immediately, as we read a small metal plate on a power pole a block or so away clearly. We could observe individual knot holes and cracks in the pole. Unfortunately, the red dot viewfinder could not be seen in the bright light, so we could not fine tune that. Then, we looked at a nearby mountain range, and could pick out individual branches on trees on the mountainside. Later in the evening, the moon came out, and we were blown away at the detail we could see on the moon. We had heard we would need a moon filter, but we could see just fine without one. We could now see the red dot in the viewfinder and get that aligned. I will say that the slow motion controls had a hard time keeping up with the moon's movement across the sky, and we resorted to just nudging the tube with our hands and that works better. 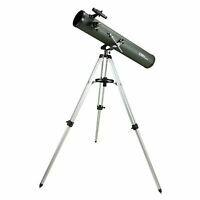 I have no experience with these things, so when I read reviews that say the eyepieces aren't very good, I have no reference point to put that into context. I will say that the higher power eyepieces were darker and harder to get into focus. The field of view was much smaller. 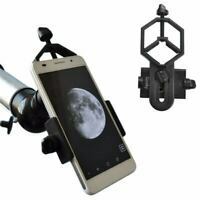 They also made it harder to track the moon and more greatly magnified shaking and tremors in the tripod. Would better quality eyepieces improve any of those things? How much of that is just the fact that they are, indeed, higher power? I won't know until I am able to compare. I watched the instructional DVD, but it gave no new information over the instruction manual other than better explaining polar alignment, which we have not tried yet. I installed the star finding software on our PC, but I must say that it baffled me. There is a PDF user manual on the disc, but I just skimmed it and my head started to hurt so I stopped. That might be the worst thing about this scope, but it's a pretty minor issue. We look forward to clearer and warmer nights and getting a look at planets and other deep space targets. My son is thrilled with his gift, and it didn't break the bank. I'm pleased because the scope performs better than expected. 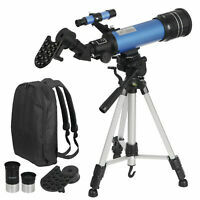 Having never looked through a telescope before, I guess I'm easy to impress, but that is the target audience for this scope, beginners that want to get started but don't want to play with a toy. It's definitely not a toy. Plusses: powerful, well built, ready to assemble and use at a basic level, impressive looking, not a toy at all. Minuses: Heavy and hard to move around when fully assembled (you have to remove the accessory tray in order to fold the tripod back up), red dot viewfinder not visible in daylight, slow motion mount controls a bit too slow in my opinion, low quality eyepieces (I'm not sure myself, but all the other reviewers who know better say so.) Star finder software not very user friendly. Considering what I paid and what I expected, I'll take the minuses and am still very pleased. The Meade Polaris 127 EQ is a great scope for teaching the basics of telescope alignment and use, but it definitely needs lens upgrades to be a better scope. I would say it is a good value for the price, but buy some upgraded lenses for a better experience.